THE PRICE OF filling up your car has gotten cheaper over the last four months and the price of petrol and diesel looks set to keep falling. 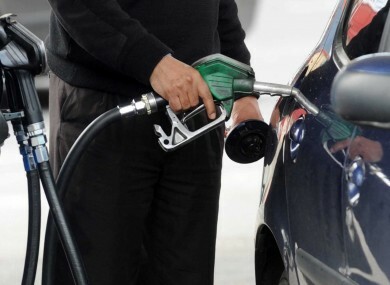 A report by the AA has found that the cost of fuel has fallen for the fourth successive month with a litre of petrol at 131.9c and diesel now costs 119.2c per litre. While it is welcome news for motorists, the AA said while the immediate outlook is good, there is no way to know if the trend will continue into next year. Conor Faughnan, AA director of consumer affairs, said: “The last several months have brought good news for motorists when it comes to fuel prices and July has, thankfully, continued that trend. “Driving is an essential part of the lives of many people who rely on their car to get to work or college due to the absence of reliable public transport in many parts of the country, especially rural areas,” Faughnan added. “No-one is arguing for fuel to not be taxed, but instead we need to have a sensible taxation system in place when it comes to petrol or diesel,” Faughnan added. Email “Petrol and diesel prices have fallen for four months in a row and are set to drop further ”. Feedback on “Petrol and diesel prices have fallen for four months in a row and are set to drop further ”.